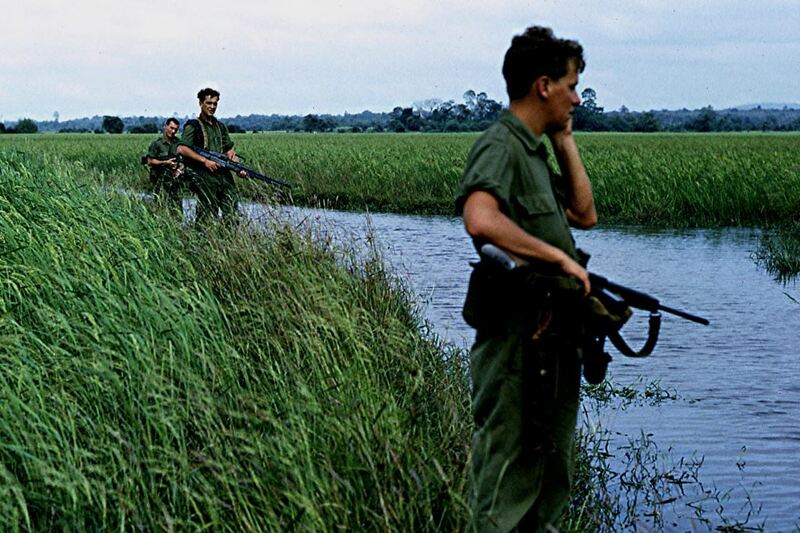 The October issue of Vietnam Magazine had an article on the Australia's FN FAL L1A1 rifle. Click here to view. I sent this to our Aussie members which prompted some discussion. "Thanks Bill for that, the article though had a few mistakes (the L1a1’s bolt did not rotate it dropped down) and a few omissions of facts. After WW2 it was realised that a less powerful round like the German 7.92mm Kurtz (7.92 Short) was more favourable than the high powered standard rifle, the British .303, Americans .30 06, the Germans 7.92x57mm, Russians 7.62x54mm all were bullets that could kill out to over 1000 metres . It was found that people in combat rarely shot at anyone over 300 metres, so a large cartridge was a waste. A smaller round meant more rounds could be carried and with less recoil in the smaller round the rifle could be lighter, could fired on fully auto and it was easier to train green troops quicker. Everybody it seemed (except the Americans) wanted a smaller round for it’s army’s rifle. The Russians adopted the SKS and then the AK47 firing the 7.62 x 39mm. The British opted for a short .280 round (very similar to the AK round) and designed a Bullpup rifle, the EM2 around it. The Americans demanded for NATO a round with the same capabilities as the .30 06, so the .30 cal (7.62x51mm) round was adopted. The Americans adopted the M14 rifle, which was really a 1930’s design. John Garand had designed a rifle almost exactly like the M14 in the 1930’s to replace the Bolt action Springfield 03. The American Brass did not want a rifle with a 20 round detachable magazine and with no wood that ran to the end of the barrel, it was no good for parade ground drill!! So a complicated clip system was designed for the .30 Cal M1 Garand, a system that did not allow a half empty magazine (or clip) to be replaced unless the round in the chamber was removed. This is not a very good idea in combat, but the rifle was a very good for drill on the parade ground. The British who owed billions to the USA for equipment bought during WW2 could not afford to design another rifle to take the 7.62mm NATO round. FN’s FAL could be adopted to handle the larger American round so the British modified the FAL and called it the SLR or L1A1. Over 70 other countries also adopted the FAL/SLR including Australia, Canada, New Zealand, South Africa and Israel. Less than 10 years after forcing NATO to adopt the 7.62 x 51mm NATO round the Americans finally realised that a smaller round was better and started adopting a .22 calibre round, the 5.56mm for the M16. This round in my opinion was a terrible choice, it’s 55 grain projectile compared with the Russian AK’s projectile of 120 grain or the 150 grain of the 7.62 NATO was far too light. The 5.56mm projectile was deflected too easily by scrubs and foliage, the Russian 7.62 x39 or the British .280 would have been a better choice, not too heavy and not too light. The guys in Afghanistan today are calling out for a round with more grunt that will penetrate mud brick walls. Ian “Bagzar” Stiles 3 SAS Sqn SVN 1966-67, 69-79." As an Artillery man, I found the rifle a great piece of kit. I had done quite a bit of rabbiting in my earlier youth and was quite a good shot always trying to headshot the rabbits as it kept the meat bruise free. My practise was to use a spent .22 cartridge as the target and practise on the 20 yard range until I could hit one every couple of shots. Never got to hitting it every shot. With this experience I found the SLR extremely accurate and very nice to shoot being able to reduce the recoil with the gas regulator. It was easy to hit the target on the 300 yard range, even with a cross wind. My story about the comparison with the AR15 is a situation when the 1st/83rd compound was fired on during TET and Barry Guzder was nearly decapitated when the local VC fired from a tree through the 31D listening post. At that stage we were perched on top of post 6 and a sitting duck for a good rifleman. Fortunately the local VC was only a reasonable shot. We all raced to the berm and Stan (Pablo) Briggs and I got to the LP to ensure that Barry was OK. We decided that I would fire some tracer rounds into the area where the firing came from to try and draw fire. (I had a magazine of tracer for some strange reason) Pablo was then going to fire back with his AR15 on full auto. I fired several rounds in the area and into the tree, but no one fired back. I said to Pablo to fire a couple of bursts auto into the area. He fired one shot and then mentioned some expletives. For the next two hours he looked for something to get the shell casing out of the breach. The round had stuck and the ejector just broke the rim off the cartridge. The SLR just kept on going. I remember in the black and white TV days they showed the SLR in all situations where they took it out of a bath of water and fired it, then through in a mud bath, left it there for a couple of minutes, brought it out and fired several shots with it. The only disadvantage of it over the AR15 was the weight, especially when you also carried the 7 magazines of ammo. I have attached a photo of me pretending to be an infantryman with my trusty and very accurate SLR. You can see we are not infantry by the way we are dressed, not hats and sleeves rolled up.